It’s a big day for me today, in the life of what will be my debut novel – Safe Hands. The time for hiding behind procrastination and self-doubt has come and gone. I’m committing to a release date! 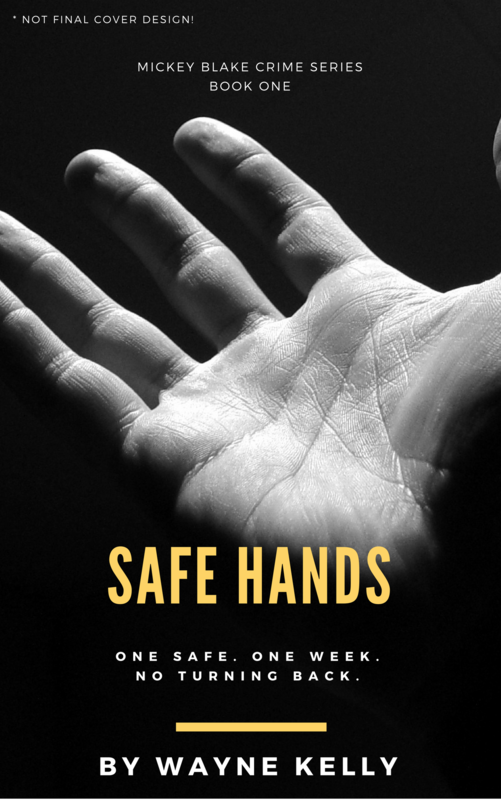 SAFE HANDS is a contemporary crime novel told in first person by MICKEY BLAKE, a sarcastic safe cracker in his late fifties. A man who can open any vault using only his hands. For the sake of his dying wife and a son that hates his guts, Mickey is forced out of retirement and given one week to rob a rundown casino in Skegness. Back in October, I recorded an interview with The Creative Penn herself, Joanna Penn, for an episode of The Joined Up Writing Podcast. It was a fascinating chat and you can listen to it here. However, off-air Joanna asked me a direct question . . . I laughed, muttered something about ‘good question’ and tried to change the subject. Joanna was having none of it. She asked me again, a little more forcefully this time, reminding me that timescales and deadlines are the only way things are achieved. So, she threw down the gauntlet for me to consider a date and announce it by the time her interview went out on the podcast. With trepidation, I accepted the challenge. The thing is, even before my chat with Joanna, I had long been considering what I should do with the novel when I finally got around to finishing it. Should I do the rounds, sending out the first three chapters, looking for representation and a traditional publisher? Spend several months waiting to see if it gets picked up while I tentatively start work on the next book? Or should I put all my time and effort into going the Indie route – producing a professional product, properly edited with good cover art – and publish it myself? I’ve been following developments in the world of Indie Publishing for years, listening to The Creative Penn Podcast and reading lots of great books on it too. Books like Joanna’s ‘How To Make A Living With Your Writing’ and the excellent ‘Write. Publish. Repeat.’ by Sean Platt and Johnny B Truant. I’ve interviewed other successful indie writers like Rachel Amphlett too, and I love the idea of being able to manage the whole process from start to finish. Yes! But, I’ll let you in to a little secret. Unless you’re Stephen King or Dan Brown, EVERY AUTHOR has to do loads of their own promotion. Why not take control of my own destiny and – more importantly for me, right now – set myself a deadline and FINISH THE DAMN BOOK?! I have nothing against Traditional Publishing, but Joanna’s challenge came at the perfect time and made me realise: I need a deadline. My day job in video production relies on me hitting deadlines with every project I work on, so why do I treat my writing projects so differently? I thought long and hard about the release date. My first thought was something meaningful or memorable to me – my birthday, perhaps, in April? However, as soon as I started to work backwards and considered everything that still needs to done – my next draft, a professional edit, beta readers, cover art, formatting, promotion and . . . things I haven’t even discovered yet – that timeline was going to be a bit tight for someone who is learning much of the publishing side of things for the first time. So, the date I decided on is . . . June 24th, 2018. There, now not only have I said it out loud, I’ve committed it to the blog. So it is written, so shall it be. I’ll be continuing my weekly updates on the blog and, if you join the mailing list, you will stay up to date and be able to get your hands on the bonus material I’ll be sending to my subscribers before Christmas – including a free short story prequel to the novel. So right now I’m scared, excited but focused and ready to achieve my goal. Will you help me along the way? Tell me in the comments what you’d like to know about the book, characters or the process and I’ll cover it in future posts. Failing that . . . wish me luck!! Excellent news and good luck. Have followed Mickey all the way on this. Its in my diary and I’ll be waiting for the combination number to open the safe. Thanks Keith. Trusted critique from you and the gang can only make it better.